It is estimated a sum of 11,000 people in total are trying to cross the border into the United States, and it is estimated that about 100 migrants in the invasion to the United States could reach the port of entry between Tijuana and San Diego this weekend. 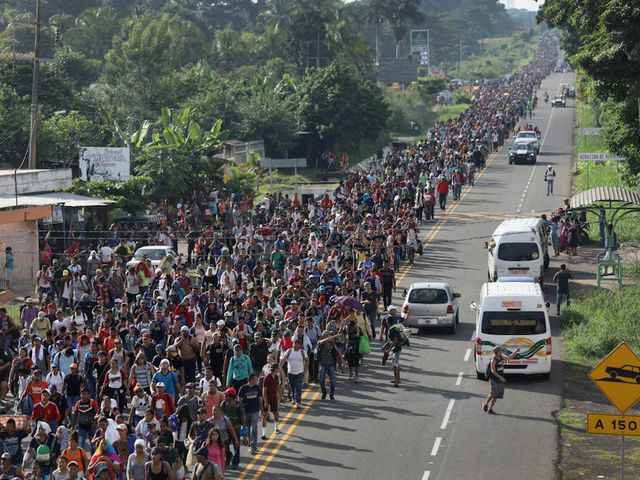 Some people call this flow of people from Central America a caravan, but this is nothing less than an invasion. They have the audacity to ask for buses so they don’t have to walk anymore. Many of them are already traveling in buses anonymously donated by forces set to destroy the United States. It was reported that last Wednesday a group of about 700 Salvadorans set out from the Capital of San Salvador with plans to reach the U.S. border. The ones shown on videos who are already traveling on the donated buses and trucks are displaying the Salvadoran flag with total lack of respect to the country they wish to grant them Social and Economical Asylum. There is no such thing for those people as Political Asylum because they are not politically persecuted in their country of nationality. If they feel the need to bring with them and display the flag of their country, they should stay where they belong. I watched with great interest an interview of a reporter with a woman in the invasion who claimed that Mexico has offered some of them asylum and a place to live, but they refused because they are being paid to continue to the United States. We all know who that evil person with desires to destroy our country is, but it is totally incomprehensible that our government with expert intelligent agents cannot put a stop to such evil act regardless of the amount of money the devil has. Presidents of El Salvador, Guatemala and Honduras need to take responsibility for the country they wanted to represent and its people. them. Guatemala president, Jimmy Morales, a comic who doesn’t laugh anymore because of internal situations in his country, is laughing big time now at all of us because he is sending hundreds of his countrymen for us to support because he failed his responsibilities as the president of his country and to his people. Juan Orlando Hernandez, the president of Honduras, as a good former businessman, wants to operate his country as a business transaction — all the benefits for himself without the responsibility of the people of the country. What I honestly want someone to explain to me as though I were five years old is: where is the person who is financing the invasion plans going to put and support the more than 11,000 people when we have all over the United States more than that amount in homeless AMERICAN people. Why doesn’t he donate some of the money he so desperately wants to spend to destroy our country, to support our homeless people. I am sure he is not planning to give shelter to many of those invaders at his home. There are many people in need of help in their own country. The homeless population in Budapest, Hungary is as high as 30,000 and they are persecuted on a large scale. A former engineer who lost his house was brought in front of a judge for being homeless. He was let off with a warning and a threat of 30 days in jail. A woman who’s been having a rough time sleeping in Budapest for the past five months after losing her home was also brought in front of a judge. She also received a warning. This person financing the invasion to the United States should consider financing a place for the homeless people in Budapest, Hungry instead of destroying our great nation. Next story What gives with the election results — and nonresults?